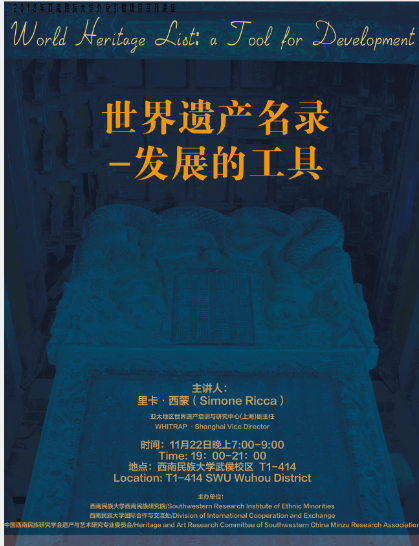 On November 22nd and 23rd 2018, Dr Simone Ricca, Deputy Director of WHITRAP Shanghai, will deliver two lectures at Southwest Minzu University, Chengdu, in framework of the ‘2018 SWU Foreign Expert Project Lecture Series’. The World Heritage List is likely the initiative of UNESCO that is most known by the large public. However, few are actually familiar with the concepts, mechanisms and actors underpinning the UNESCO Listing process. The lecture aims to introduce the World Heritage Convention, underlining its constant evolution and growing connections with the larger framework of the UNESCO Cultural Conventions and of the United Nations Sustainable Development Goals (SDGs). In the past 40 years the definition, and the relevance, of “heritage” has substantially evolved, blurring the traditional separation lines between natural, cultural, tangible and intangible heritages and acknowledging the concept that heritage is not a given element, but a social construct. More and more, the List is becoming an effective support to culture-led territorial and urban management policies. The nomination of sites for inscription on the UNESCO World Heritage List becomes an opportunity to develop research and knowledge, establish and reinforce local participation and capacities, foster sustainable development, and define long-term preservation strategies and risk management programmes. The final part of the lecture will briefly present the structure of UNESCO World Heritage Centre and the activity of the World Heritage Institute of Training and Research for the Asia-Pacific Region (WHITR-AP), underlining the growing role played by China in this international arena. Cultural heritage is a social construct with social, economic and environmental components, but it is also an important element for the definition of national and community identity. As such, it is often subject to political pressures, planned or unintended distortions, and even deliberate destruction. As reminded by Graham, Ashworth and Turnbridge, “Heritage is the contemporary use of the past” and architecture planning and archaeology are powerful tools that can substantiate and materialize political theories. The choice to “protect” built heritage is often connected to underlying ideological frameworks mostly non-evident to the visitors and to the same professionals involved in its preservation and development. For its international relevance and its strong “branding” value, the World Heritage List tends to become a catalyser of strategies designed to legitimize specific narratives and to communicate a carefully designed image of a country to the international community. How do these ideological/political readings reflect on the preservation and enhancement plans put forth for the major world heritage sites? What actual impact can they have on the selection and display of cultural sites? 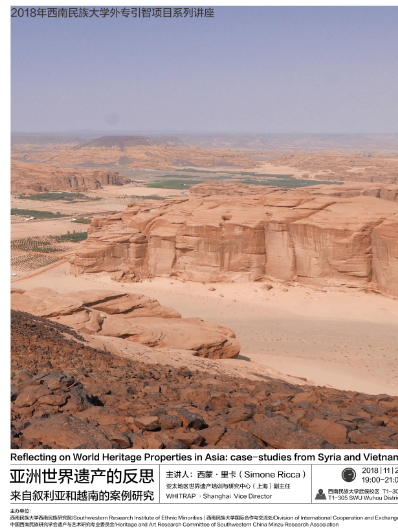 Two examples from Vietnam and Syria, permit to highlight some of the underlying issues related to heritage preservation and to draw the attention to the often un-perceived implications of cultural heritage preservation in the World Heritage context.